ESPN's coverage of Wimbledon will have a distinctive English touch as the network will play music and footage of Sting with the Royal Philharmonic Concert Orchestra during the network's coverage of the tennis championships from June 21 to July 4. 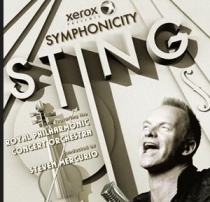 The footage from Sting's current tour with the Royal Philharmonic Concert Orchestra will include songs from his upcoming album, "Symphonicities," and some old favorites not on the CD. "Symphonicities" will be released July 13 and you can preorder it at Amazon.com. * -- Versions of these songs from "Symphonicities" aren't yet available on iTunes, so links are for previous versions. "Loyal fans can only smile as Sting finds more ways to reinvent or deconstruct the classic hits than they ever thought possible. Friday's show was in the same MGM Grand Garden arena as the Police reunion of two years ago, and those at either concert still haven't heard 'Every Little Thing She Does is Magic' with the rinky-tink piano that drove the original recording. What the faithful have learned is to trust Sting's taste. Here, the leap of faith was that the orchestra was there for a reason, not just replacing keyboard textures with Summer Pops pomp..."